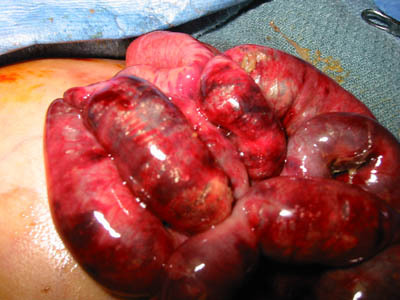 Definition: Necrotizing enterocolitis is an inflammatory process of the intestines seen in about 2-5% of premature infants. It may be mild and localized, or may be severe and involve the entire GI tract. The inflammation usually begin within the layers of the bowel wall may lead to bowel necrosis (death) or bowel perforation. Classification: The classification suggested by Bell was initially used to help physicians standardize their discussions about this wide spectrum of intestinal involvement. Etiology: The cause of NEC is still idiopathic (unknown). We do know that a combination of prematurity and immature GI defense systems is key. The actual cause is probably multifactorial. Mucosal ischemic injury is important, as is an impaired gut barrier. This allows bacterial invasion into the GI tract that incites an inflammatory response. There appears to be a role for the loss of adhesion between the cells. Feedings: Breast infants appear to be more resistant to stress induced NEC than formula fed infants. Formula-fed babies have 6x the incidence of NEC. Incidence: NEC Occurs in 10% of Very Low birthweight babies: 1 – 2.4% per 1000 Live Births. 1 to 5% of NICU patients developed NEC. History of NEC: NEC is a Relatively Young Disease. It was first well-characterized in 1964. Prior to that year, it almost did not exist. It was not until respiratory support was adequate to save premature children with immature lungs that the disease became clinically important. The first case was probably described in 1890. In 1943, the first surgical success was reported by Agerty on a 35 weeks EGA, ileal perforation. The modern era of NEC was ushered in by Berdon (New York, 1964) who reported 21 cases of True NEC. In the 1960s “early operation” was advocated. In the 1970s Nonsurgical management prevailed. In 1978 Bell published a classification system. Symptoms: Abdominal Distention (78% to 98%),Lethargy, gross or occult blood in Stool (79% to 86%), Increased Gastric Residuals (>70%), temperature instability, bilious Vomiting (>70%), Apnea/Bradycardia. Physical Exam: Abdominal Distention, abdominal wall redness, abdominal mass, abdominal wall thickening (edema), jaundice, lethargy, pain on palpation of the abdomen. Pneumatosis Intestinalis: This finding has often been considered synonymous. Pneumatosis intestinalis means gas within the two main layers of the bowel wall. Gas produced by bacteria separates the mucosal lining from the serosa of the bowel. Initially, small round bubbles appear in the bowel wall. As the gas increases, the mucosal lining of the bowel separates completely giving rise to linear patterns of gas on x-ray. The “typical” location is ileum and right Colon, but it may appear anywhere within the intestine. It is actually not specific for NEC and may be seen in any ischemic (lack of blood flow) situation, or even found incidentally in older patients. Pneumatosis Coli is the same process within the large bowel. Early Intervention: At the first sign or symptom of NEC, feeds should be stopped and the patient examined. X-rays are taken of the abdomen including the lower chest. Our clinical impression is that the extent of bowel involvement is “set” at the onset and cannot be changed by any intervention, surgical or otherwise. Simply stated, early surgery does not appear to limit the extent of the bowel necrosis. Radiographic Findings: Fixed & Dilated loops of bowel, portal vein gas (in an arborizing pattern over the liver). 19% of patients with NEC develop PV gas. This ,may be from gas that has dissected from the bowel into the mesenteric veins then to the Portal Veins. Portal venous Gas may indicates more severe disease and may or may not be an indication for surgery (unclear benefit). Portal gas: Overall, 90% of pts with PV gas develop necrosis, and about 52% have total intestinal necrosis. PV Gas is even worse is small (less than 1000g) infants. Approximately 71% will have total intestinal necrosis, and overall 93% mortality. Medical Treatment: NPO 10 to 14 days. Ampicillin, Gentamicin, Clindamycin for 10 to 14 days, Orogastric Tube decompression of the stomach, supportive care such as ventilator support if needed. Blood Cultures are obtained. Indications for Operation: The Only Absolute Indication for Operation is Bowel Perforation. Other Relative Indications: Peritonitis, abdominal wall redness (erythema), fixed metabolic acidosis despite HCO3, fixed intestinal loop (>48hrs), rapid accumulation of fluid. Some surgeons recommend operation for a worsening in the clinical findings (Foglia, 1995) Accurate Predictors of Bowel Necrosis: Pneumoperitoneum (abdominal air outside of the bowel), abdominal paracentesis (need aspiration of fluid showing a perforation), fixed bowel loop, fixed abdominal mass, erythema of abdominal wall. Transverse incision, exploration of the abdomen. Resection of necrotic bowel and ostomies created. Key Surgical Points: Pneumatosis is not removed if otherwise viable. If questionable viability, good surgical judgment is key. The bowel may be left in place, resected, or a silo placed. Localized involvement called “leopard spotting” is generally removed. If a Segment 5-10 cm between areas of necrosis can be salvaged, multiple segmental resections can be done with abbreviated anastomosis and proximal diversion, or multiple stomas. How much intestine do you need? The presence or absence of colon in not much of a factor. The colon or large intestine helps with water reabsorption, but freedom from TPN is directly related to length of small intestine. The mechanism of bowel loss also plays a role. For example, if a patient has NEC and all the bowel is involved, even some of the bowel that did not require removal may not have nomrmal motility, full absorptive capacity, or the ability to adapt as well as uninvolved bowel. As a general guide, if the ileocecal valve is present, 40 cm of newborn viable bowel is needed. The presence of the ileocecal valve may be more of a marker for better adaptability of the ileum than any actual physiologic role of the ileocecal valve. If no ileocecal valve is present, the number is difficult to predict, but probably >100cm is needed. The confounding factors are: Normal newborn bowel length at birth is variable. 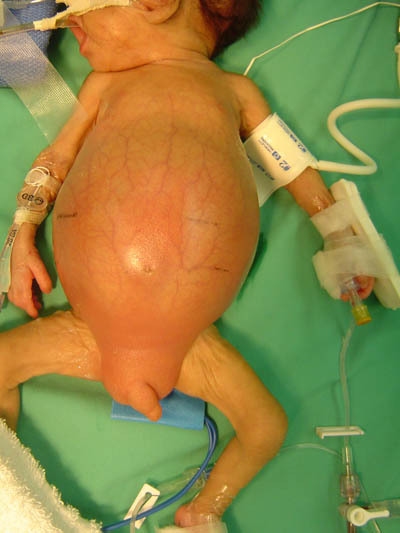 Premature infants have varying lengths of bowel (see below). Different types of bowel have different capacities to adapt. Our understanding of motility of the NEC injured bowel is poor. Bacterial overgrowth is variable, and treated differently at different centers. Despite standardization of measurement on the non-stretched antimesenteric boarder of the bowel, these measurements have some degree of intrinsic error. Normal length: Overall intestinal length for infants between 19 and 27 weeks gestation increased from 142cm (+/- 22 cm) to 304cm (+/- 44 cm) for a comparable group over 35 weeks gestation. Touloukian RJ, Smith GJ.J Pediatr Surg. 1983 Dec;18(6):720-3. Postoperative Care: For surgically treated infant, feedings can be resumed when bowel function returns (7-10 days), ostomies are generally closed in 8 weeks, and ideally more than 4 ½ lbs. Early stoma closure may be done for significant fluid or electrolyte losses, but is technically more difficult and may result in more operative complications. Survival: Average Survival in 1970’s was 40-60%. In 1990 Ricketts published (World J. of Surgery)70% Survival for 100 consecutive operative cases of NEC. STEP Procedure: Serial Transverse Enteroplasty is a bowel lengthening procedure which shows great promise. Developed by Dr. HB Kim and Dr. Tom Jaksic in Boston, the procedure is now performed throughout the United States. The CAIR clinic at The Children’s Hospital, Boston (www.childrenshospital.org/clinicalservices/Site1993/mainpageS1993P0.html) is an excellent source of information on short gut syndrome and bowel lengthening surgeries. Patients done by surgeons at Pediatric Surgeons of Phoenix are entered into the STEP Registry to evaluate long-term results of the procedure. Bianchi Procedure: First procedure for bowel lengthening. This is a technically difficult procedure. Late Complications: Intestinal stricture: usually results from an area of ischemic bowel which healed with dense scarring. The incidence is 11-36% and occurs more commonly in medically treated NEC. The most common site is the left colon. All children must have a BE prior to ileostomy closure, or the colon must be evaluated intraoperatively for stricture. Short guy syndrome: functional syndrome related to inadequate remaining bowel length or inadequate absorption of remaining bowel. Bacterial overgrowth: increased bacterial counts within the bowel lumen which decreases absorption. This may be both caused by and treated with antibiotics. Prevention: Centers of Excellence: Boston Children’s Intestinal Rehabilition clinic is an excellent resource for care and a leader in the research and care of children with short gut syndrome. It is also the site where the STEP procedure was developed. R. Lawrence Moss, M.D., Reed A. Dimmitt, M.D., M.S.P.H., Douglas C. Barnhart, M.D., Karl G. Sylvester, M.D., Rebeccah L. Brown, M.D., David M. Powell, M.D., Saleem Islam, M.D., Jacob C. Langer, M.D., Thomas T. Sato, M.D., Mary L. Brandt, M.D., Hanmin Lee, M.D., Martin L. Blakely, M.D., Eric L. Lazar, M.D., Ronald B. Hirschl, M.D., Brian D. Kenney, M.D., M.P.H., David J. Hackam, M.D., Ph.D., Daniel Zelterman, Ph.D., and Bonnie L. Silverman, Ph.D.
Background: Perforated necrotizing enterocolitis is a major cause of morbidity and mortality in premature infants, and the optimal treatment is uncertain. We designed this multicenter randomized trial to compare outcomes of primary peritoneal drainage with laparotomy and bowel resection in preterm infants with perforated necrotizing enterocolitis. Methods: We randomly assigned 117 preterm infants (delivered before 34 weeks of gestation) with birth weights less than 1500 g and perforated necrotizing enterocolitis at 15 pediatric centers to undergo primary peritoneal drainage or laparotomy with bowel resection. Postoperative care was standardized. The primary outcome was survival at 90 days postoperatively. Secondary outcomes included dependence on parenteral nutrition 90 days postoperatively and length of hospital stay. Results: At 90 days postoperatively, 19 of 55 infants assigned to primary peritoneal drainage had died (34.5 percent), as compared with 22 of 62 infants assigned to laparotomy (35.5 percent, P=0.92). The percentages of infants who depended on total parenteral nutrition were 17 of 36 (47.2 percent) in the peritoneal-drainage group and 16 of 40 (40.0 percent) in the laparotomy group (P=0.53). The mean (±SD) length of hospitalization for the 76 infants who were alive 90 days after operation was similar in the primary peritoneal-drainage and laparotomy groups (126±58 days and 116±56 days, respectively; P=0.43). Subgroup analyses stratified according to the presence or absence of radiographic evidence of extensive necrotizing enterocolitis (pneumatosis intestinalis), gestational age of less than 25 weeks, and serum pH less than 7.30 at presentation showed no significant advantage of either treatment in any group. Conclusions: The type of operation performed for perforated necrotizing enterocolitis does not influence survival or other clinically important early outcomes in preterm infants.